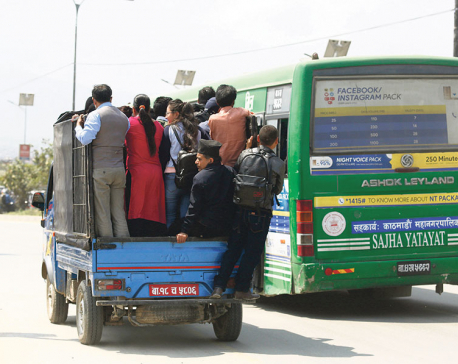 KATHMANDU, April 5: Eleven transport committees forming a cartel on the Arniko Highway halted their services on Wednesday, demanding that the government revoke the route permit awarded to Mayur Yatayat, a newly introduced bus service that poses a challenge to the cartel. This has caused great inconvenience to members of the general public as they try to reach their respective destinations. In response to the cartel's organized protest, the government opened applications for temporary and permanent permits along the affected route to end the cartel's grip. On the very day of announcement of the protest, 25 new vehicles belonging to five different transport operators were introduced on the Kathmandu-Banepa route, with temporary route permits from the Department of Transport Management (DoTM). Sajha Yatayat, City Metro, Annapurna Yatayat, Shivadarshan and Madhya Upatakya Transport Services responded swiftly and mobilizing their vehicles on the affected route. District Police Office Kavre escorted the vehicles operating to Banepa, Dhulikhel and Paunati from Bhaktapur. “We are willing to issue permanent route permits to transport companies that fulfill the requirements,” said Rupanarayan Bhattarai, director general at DoTM. He said they are preparing to mobilize more than 20 vehicles on the route on Thursday. The protesting transport entrepreneurs have accused DoTM of granting a route permit to Mayur Yatatyat without doing any research on road conditions, road capacity, the pressure of passengers and the number of public vehicles already on the highway. However, the government has rejected this argument and accused the transport committees of providing a poor service, charging exorbitant fees, disrupting free market competition and refusing to sit for talks to sort out any differences. On the other hand, the Federation of Nepalese National Transport Entrepreneurs (FNNTE), the umbrella body of transport entrepreneurs that is sheltering the cartel, accused the government taking arbitrary decisions. FNNTE Senior Vice President Bijay Bahadur Swar said they are planning to take the issue to the prime minister and the Ministry of Physical Infrastructure & Transport. “DoTM has unilaterally brought in many transport policies that are impractical. We'll bring the issue to the attention of the authorities and depend on their response, we'll take our protests forward accordingly,” said Swar. FNNTE is holding its central council meeting on April 9. Mayur Yatayat has been operating 24 buses since March 15 after securing the route permit. The buses make a round of the Ring Road and then ply the Kathmandu-Banepa section of Arniko Highway. The company offers lower rates and benefits including a free ride for the elderly and people with disabilities. Sensing a strong threat to their monopoly, transport committees operating along the highway have been organizing multiple protests, even resorting to vandalizing buses belonging to Mayur Yatayat and obstructing them at various points of the highway. The locals, who are clearly fed up with the transport committees' refusal to upgrade their service and add more vehicles, welcomed the new competition, even escorting Mayur buses to safety when confronted by the cartel. The cartel on the Arniko is just one of many across the country. The government, on several occasions, tried to stamp them out, but to no avail. Cartels have crippled the country's transport system and discouraged free market competition. 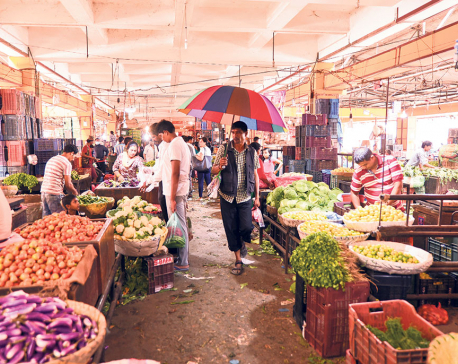 Govt says "to act tough against unscrupulous traders"